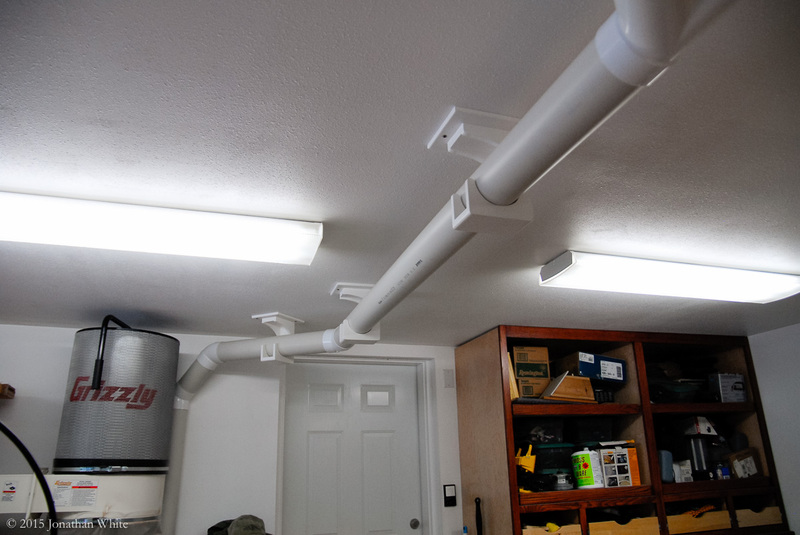 In this article, I design and build brackets to hang 4″ PVC pipe from the ceiling of my workshop. I decided to use PVC pipe for my ducting as metal ducting is very expensive. Ideally, I would have liked to use 6″ PVC pipe for the main branch of the duct and step down to 4″ at the branches that lead off to each tool. The additional cost of the pipe is not too bad, it’s about $2/ft versus $1/ft. However, the cost of the fittings (elbows, “Y”s, 45s, etc.) is about 4-5 times as much for 6″ as for 4”. For example, a 4″ Y cost me about $5.50, whereas a 6″ Y was going to cost $23.00. I realistically need no more than 500 CFM (350 would probably be sufficient) at any of my tools and my dust collector is rated at 1,700 CFM. I figured that even if I built a very inefficient ducting system, I wouldn’t reduce its CFM to such an extent that it would be below needed levels at the tool. I recognize that the 1,700 CFM rating of my collector is probably obtained with no filter attached and a wide open intake port, and that this number will drop drastically once connected to a spiderweb of 4″ pipe. The ratings that the companies give their collectors is not standardized and can be a little deceptive. The system that I’m installing likely has more joints, fitting, and angle changes than the “experts” would recommend, but I still think that my 2hp collector will have sufficient power to extract the dust as needed. Let’s hope I don’t have to eat those words later. As with just about any project, I turned to the internet in search of plans, ideas, or at least inspiration for a good pipe hanging bracket. The only things that I found were either U-shaped metal brackets or flexible metal strapping with holes every inch or so. Neither of these appealed to me. If I have to make any changes or want to make additions to the ducting later, I don’t want to have to remove all those straps. I’d rather have a system the cradles the pipe and allows for easy removal or adjustment. I decided that I would have to design something of my own. My sheet good storage bin has quite a few odd pieces of plywood, so I thought it would be a good opportunity to use up as much of this material as needed. Using a cut-off piece of PVC pipe as guide, I drew this design for the bracket. 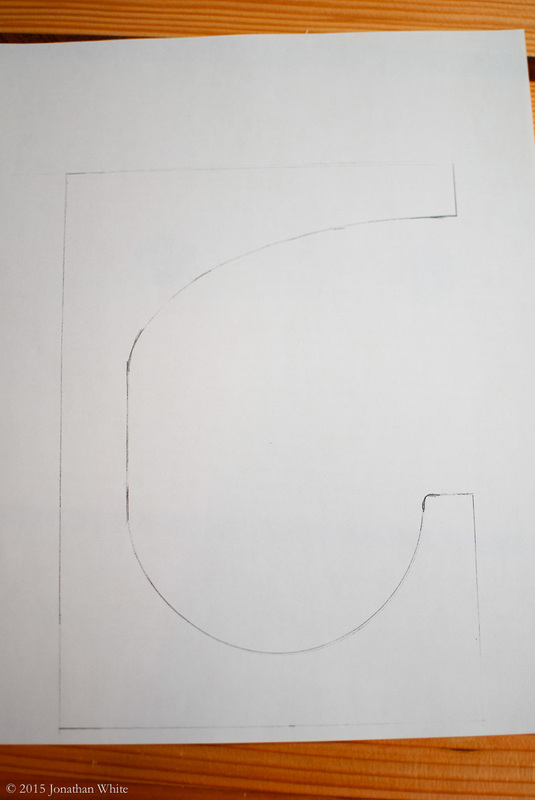 The dimensions that I decided upon were 6″ x 8½”. 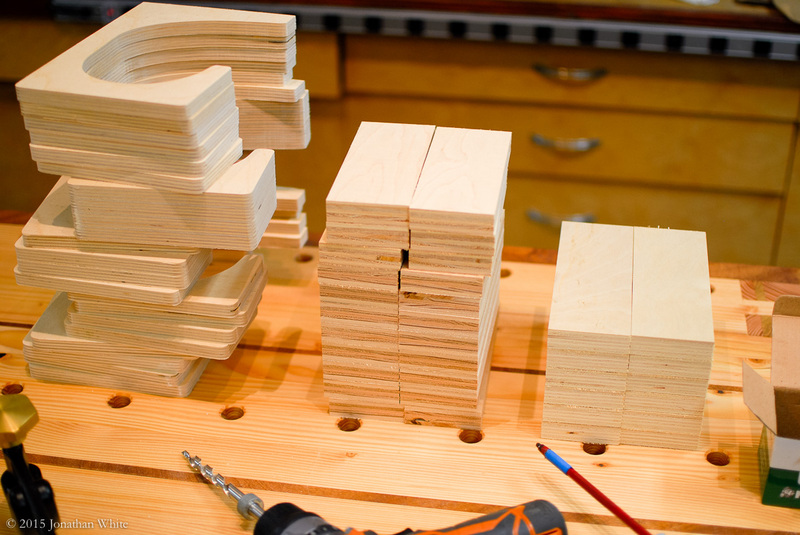 I found several pieces of ½” baltic birch plywood that I had left over from previous projects and cut them to size. 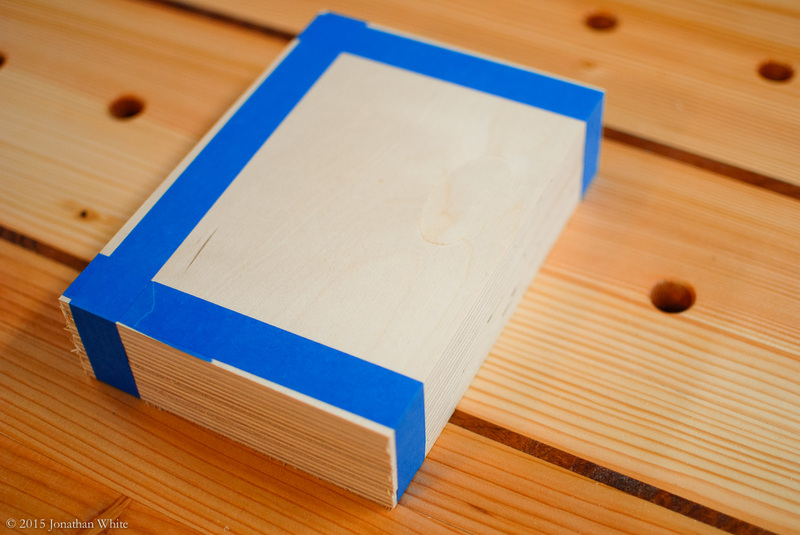 I taped these blanks together in stacks of four. with some blue painters tape. Four pieces of ½” ply taped together. I then used the sketch as a template and traced the pattern onto all the stacks. 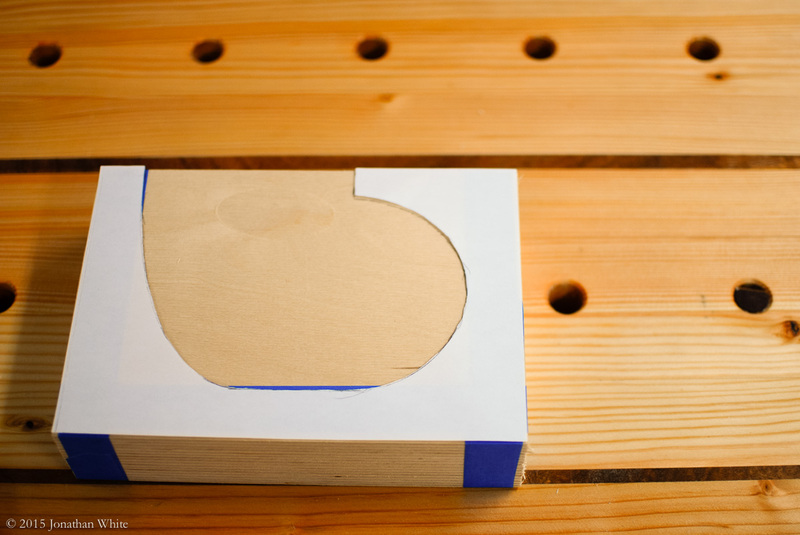 I cut out the design and used it as a template to draw on the plywood. The pencil lines left on the plywood stack. Sorry for the crappy photo below, I must have focused on the wrong spot. 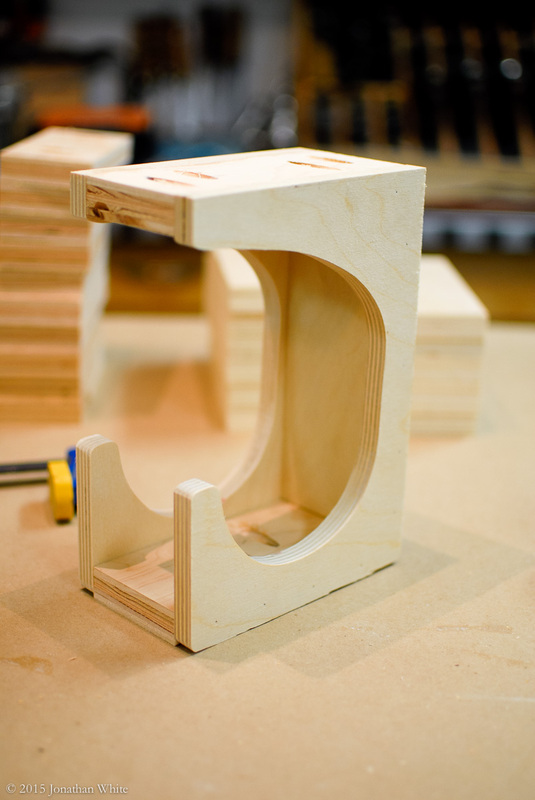 I used the bandsaw to cut out the brackets. This should keep me in brackets for a while. Here’s a whole bunch of bracket parts cut out. 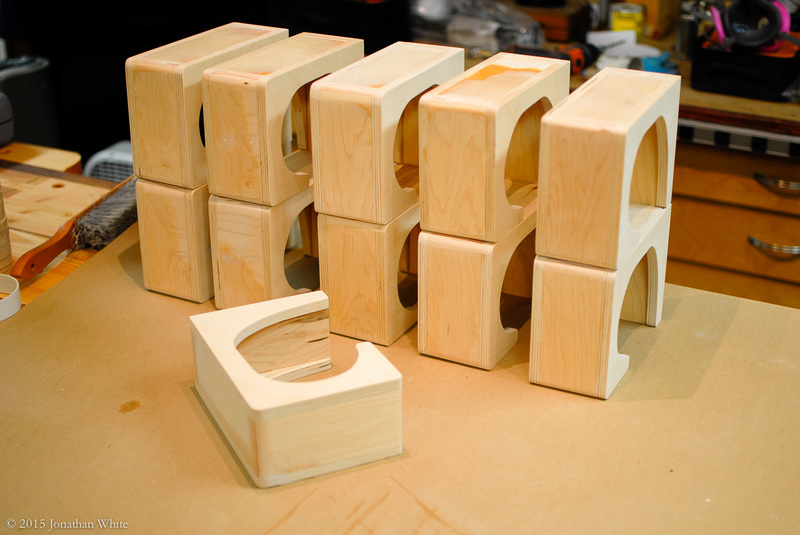 To make the ½” brackets a little more rigid, I designed them to be used in pairs. Between them, they have a top, bottom, and back all cut from ¾” ply found in my storage rack. I cut these spacer pieces about 2¾” wide, which I figured was the minimum width that I could use and still have room for pocket screws. 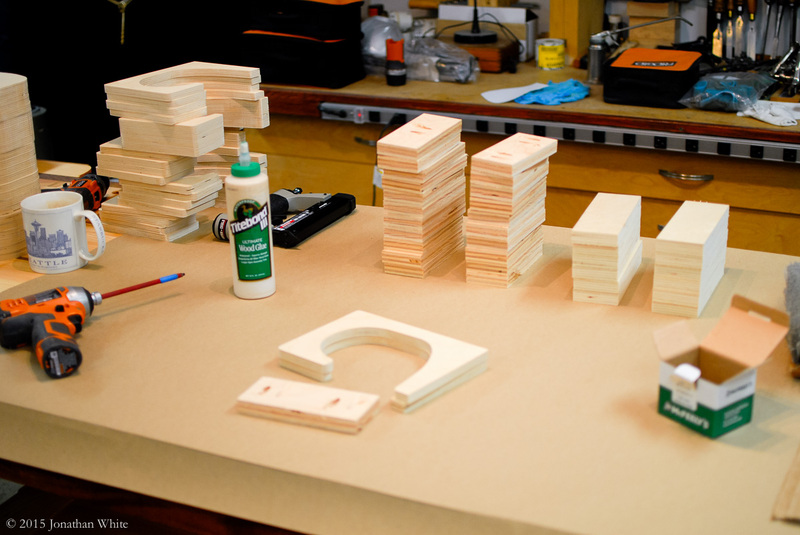 I cut pieces of ¾” ply to make up the top, bottom, and backs of the brackets. 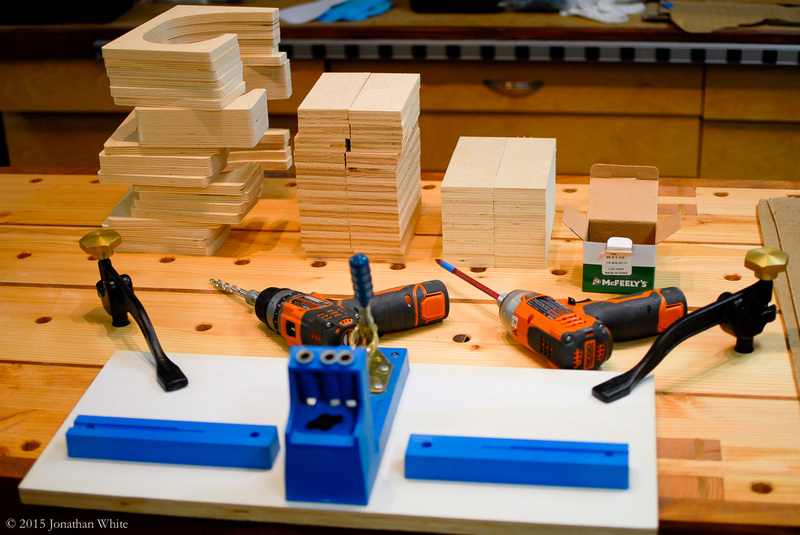 All the parts cut out and ready for drilling the pocket holes. I drilled pocket holes in all the top and bottom spacers. The backs will be held in place with glue and pin nails. I put the brackets together with glue, pocket hole screws and 23 ga pins. 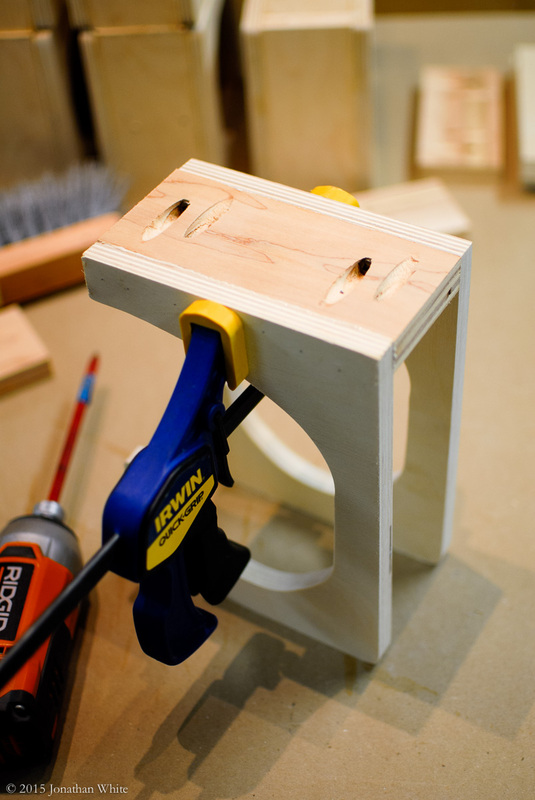 I used a quick clamp to hold the part tight while I put in the screws. I kept assembling parts until all the brackets were put together. The first bracket sub-assembly put together. 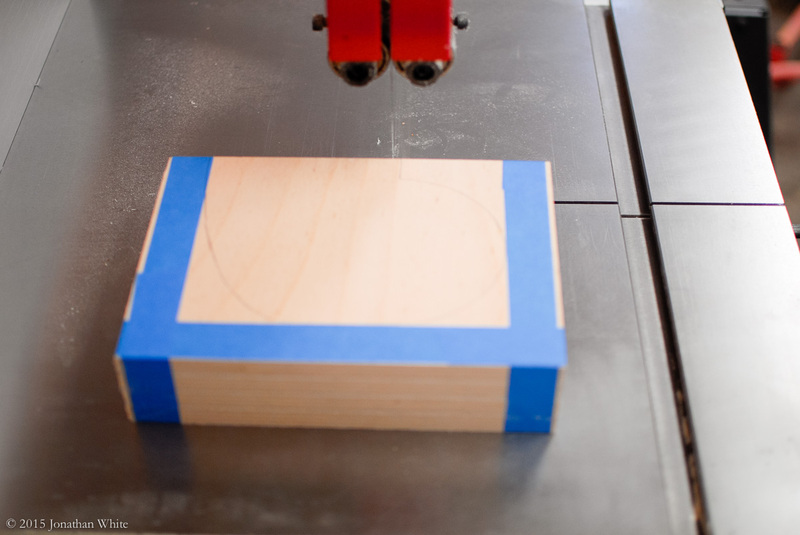 The edges needed to be smoothed and rounded over at the combination sander. 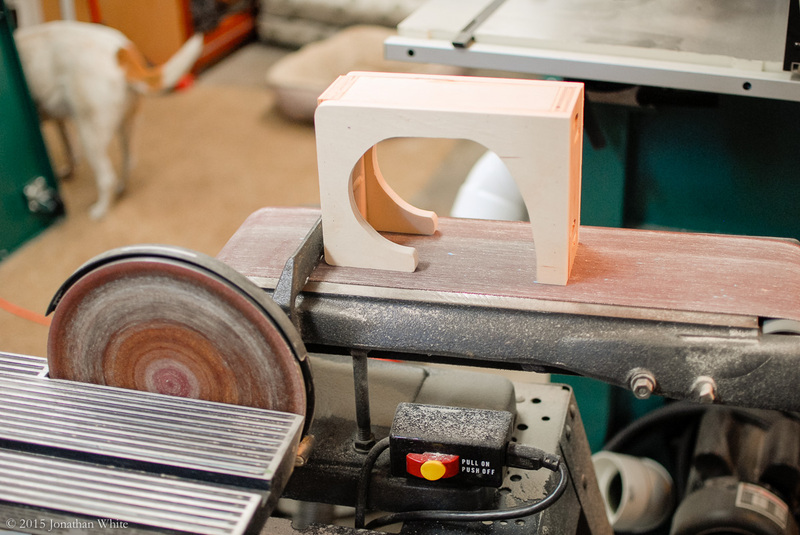 I used my combination sander to smooth the joints of all the pieces and round over the bottom corners. Then came the not so fun part. It took way longer to paint these things than it did to make them. 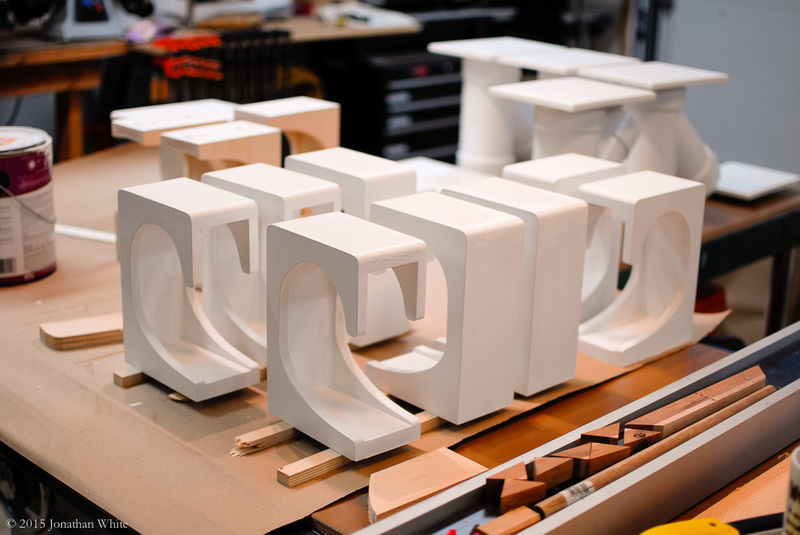 All the parts got a couple of coats of white paint. 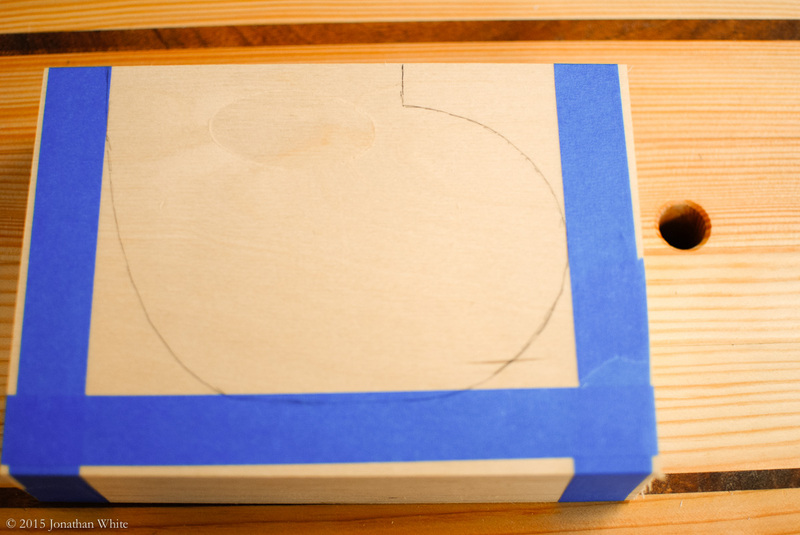 I cut up some more ½” ply into 6″ x 8″ rectangles and rounded over the edges of one side with the palm router. After a little sanding, these too got a coat of paint and were set aside to dry. 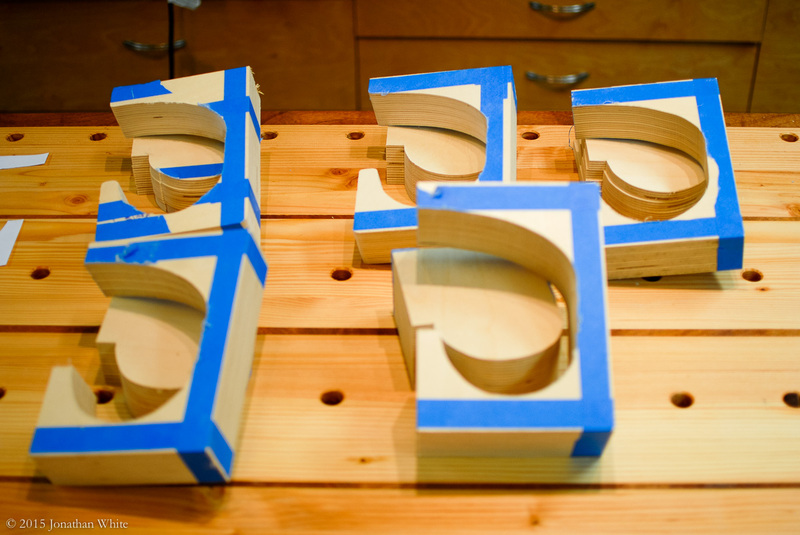 I also made a bunch of base plates out of ½” ply. When everything was dry, I attached the base plates to the bracket assemblies, screwing down from the top. The now complete brackets all got a second coat of paint. Did I mention that this painting lark takes forever!!! 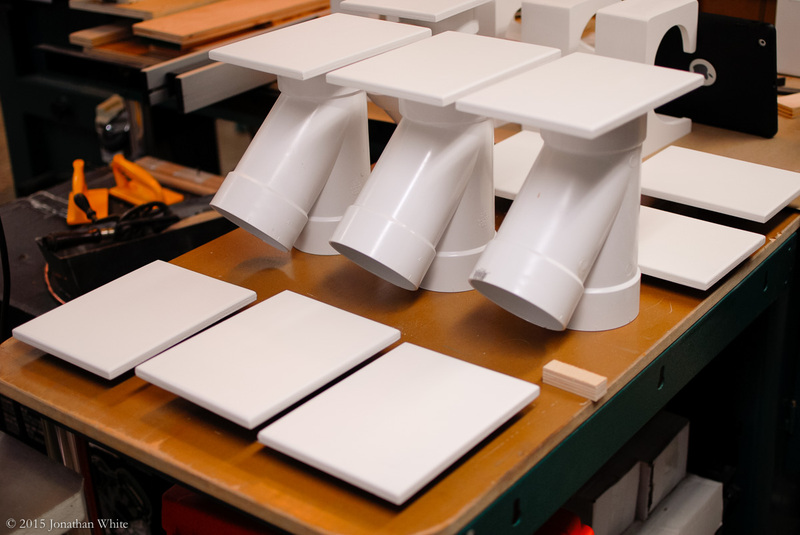 After the base plates were attached to the brackets, everything got a second coat of paint. Installation of the brackets couldn’t be simpler. A washer head screw is used and goes through the base plate and into the ceiling joist. The screws can be used in any location on the base plate, which means that you can rotate the bracket to whatever angle or direction is needed and screw through into the joist. The screws could be on the front and back, the sides, or even diagonal. It doesn’t matter as long as they go into the joist and not just sheet rock. The brackets are screwed into the ceiling joists using washer head screws. 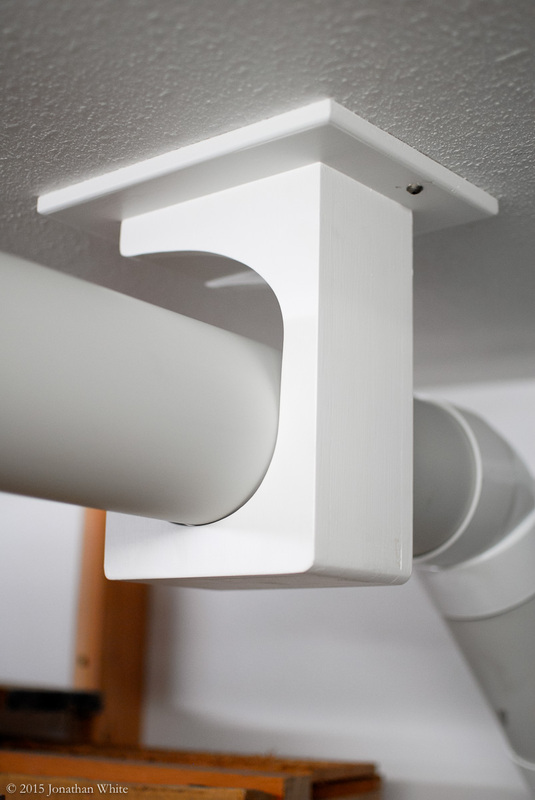 The base plate makes the brackets very versatile as they can be installed at any angle relative to the ceiling joists. Some of the brackets installed in the shop ceiling. I built 11 of these brackets, which is probably more than I need to install the system as it stands. I figured that having a few left over wouldn’t be a bad thing and would give me the ability to add-on to the ducting later without having to repeat this whole process. I like the clean look and despite it taking ages, I’m glad that I took the time to paint the brackets. 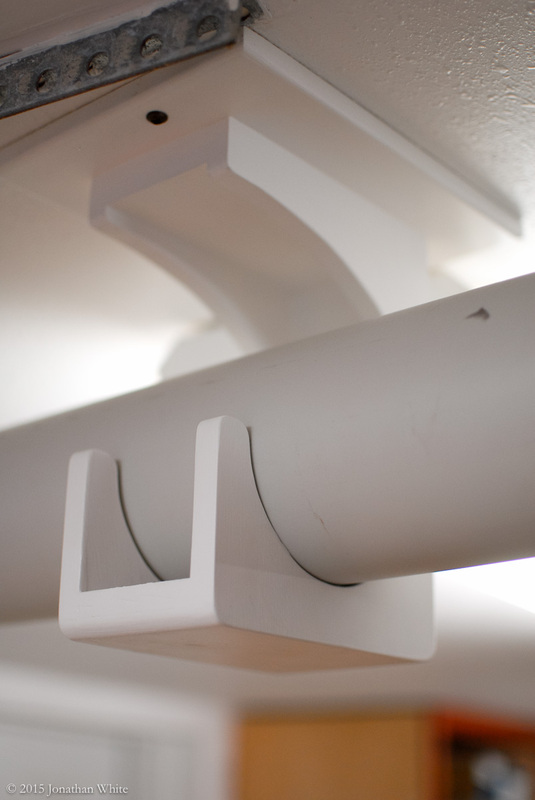 White pipe, white ceiling, white brackets. I haven’t had to buy any wood at any stage of this project and I’m glad to be finding a good use for all the scrap pieces I’d saved. Just a random visitor to your website looking to do something similar. Very impressive work and gave me a great visual for what can be done! Thanks! You’re welcome. I’m glad you found the post useful. At first I thought, “all this for a bracket?” Then I saw the brackets installed . . . they are quite elegant. Thank you for sharing. Yeah, I do tend to over do things. Thanks for your kind comment. A useful, timely hit off pinterest. I am in the process of hanging the lights in the new shop. Flooring goes in in a couple of days. I am graduating from dragging the hose , machine to machine to, toward the permanent piping. This has good potential. The time is worth the esthetic appeal. (It’s really never “just” a workshop). I’m glad you found it helpful. Having built in dust collection is a huge help once you start using larger tools. I can’t imagine feeding rough stock through the big planer anymore without my dust collection system. Even as it is, I’m amazed at how fast my separator can fills up. I’m using your great ideal I have been looking for a bracket and this one is the best. Perhaps painting everything while it is still flat, before cutting the pieces out, would save time on the paint process? Once everything has been built it would be a simple matter of touching up the raw edges. Great design, going to use it for my overhead piping. Thanks for your comments. 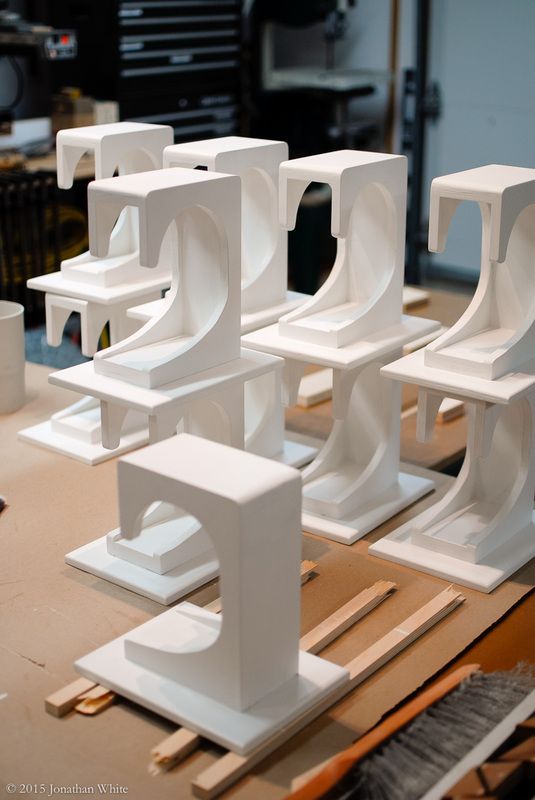 In general, I agree that pre-finishing parts before assembly can be beneficial. In this case, there was so much sanding to round things over after assembly, that I’m not sure it would have saved me any time.